"Dr. Spohn is caring and compassionate. I never feel rushed." "Dr. Terrie Spohn and her staff are competent and efficient." "I've been going here for a few months and love it! They actually care about your health." "Great service, nice facility, extremely knowledgeable staff, and a convenient location." "Very friendly and knowledgeable staff! Five stars and two thumbs up!" as gynecologic exams, birth control, prostate care, erectile dysfunction, and hormone issues. 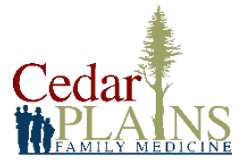 on the team at Cedar Plains Family Medicine.